Reporters can, at times, be sort of rude. Celebrities can be rude, too, and they definitely engage in a lot of bad behavior. We all know that. However, it is probably worth reminding ourselves that celebrities are people. They are rich people who are far more attractive than most of us, but they are people. They have their good days, and they also have their bad days. 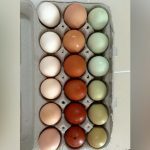 Most of them are pretty grateful for their luck, at least in my experience, but there are also questions you really shouldn’t ask anyone unless you are their spouse, doctor, parent, or legal guardian. Reporters often cross that line. Here are thirteen examples of times reporters crossed the line and celebrities responded. It really is not very nice to ask people about their romantic lives. It simply is not polite. I suppose your spouse has a right to ask about your romantic life if that person thinks you might have a romantic life outside of the marriage; however, in most cases, it just is not appropriate. It certainly is not polite if you are a reporter. 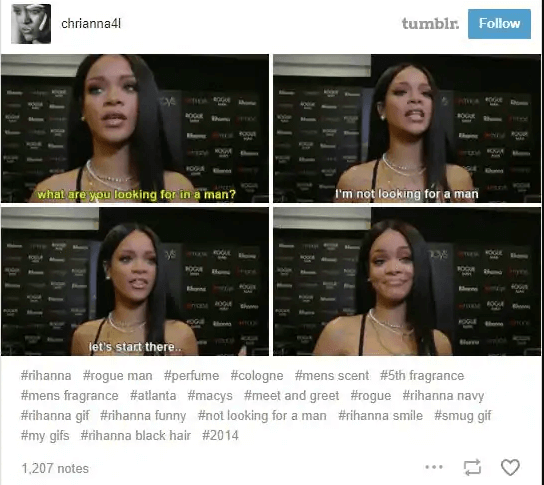 You have to give Rihanna a lot of credit for admitting that, at the time, she wasn’t really looking for anyone. There are times in one’s life when you just don’t—for whatever reason—care to be romantically involved. In case you are not familiar with Rihanna, which I can’t imagine, the very successful singer and songwriter is worth more than $200 million. If she wanted a man, she could easily get one. Apparently, a reporter asked Justin Timberlake why he is in movies, which is one of the stupidest questions anyone could ask. I think most people would enjoy being in at least one movie. As Mila Kunis pointed out, and she apparently did so in Russian, Timberlake wanted to make movies and could. 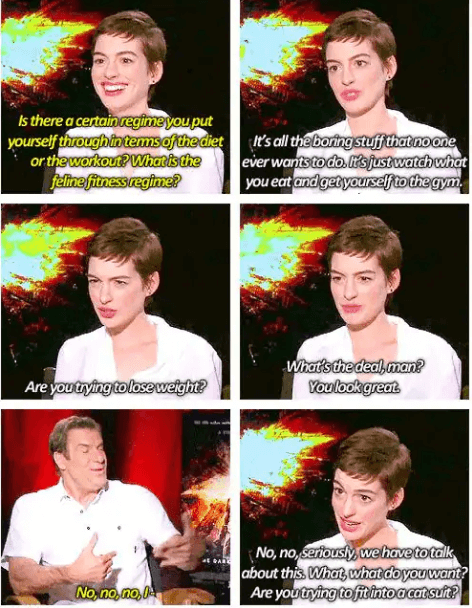 That is a pretty good reason to make a movie. She also pointed out that it was kind of a stupid question, which it was. Timberlake first became famous for being part of the boy band NSYNC, and he is currently married to Jessica Biel. Mila Kunis is a well-known actress who first became famous for starring on “That ’70s Show”. She currently voices the character of Meg Griffin on “Family Guy”, and she has been doing so since 1999. She has also been in many films. It was a stupid question, certainly. I like the simple response. Sometimes, all you can really say is “no” in response to a stupid question. Tom Hardy has had a pretty cool career. The 40-year-old actor and producer has starred in several films, including “The Dark Knight Rises” and “Legend”. He has also starred in several television shows, including “Band of Brothers”. He is also a stage actor. He has appeared on Broadway, for example. He is clearly a pretty talented guy, and he doesn’t tolerate stupid questions, which is totally understandable. As the rapper, singer, and songwriter pointed out, grown women don’t really thrive off of drama. I am not sure that is always true; some people really like drama, and it really does not matter how old they are. more influential female rappers of all time. Prior to becoming super famous, she worked at a “Red Lobster” restaurant—they actually fired her. I bet they regret that decision now. She admits she was fired from a lot from other jobs for being discourteous to customers. This is one of those questions you should not ask anyone. That is just really weird. No one deserves to know another person’s favorite sexual position unless there is an extremely good reason to know. That good reason generally involves a certain type of relationship that we don’t need to go into here. I love Lauren Conrad’s answer, though. That is just classic. been married to musician William Tell since 2014. Some dumb reporter asked Jonah Hill if he was still the “fat guy” in Hollywood, which is a dumb question and also sort of mean. The response is totally great, of course. Jonah Hill, of course, is more successful than most of us could ever hope to be. The 34-year-old actor has been nominated for an Academy Award, after all, and he’s been in many comedic films over the years. For example, he was in “Forgetting Sarah Marshall” and “21 Jump Street”. His first leading role was the film “Superbad”, which came out in 2007. That film, which was extremely successful and favorably reviewed, also starred Michael Cera, who is also known for playing George Michael Bluth on the situational comedy “Arrested Development.” A fifth season of that show, or at least the first part of it, was recently released on Netflix. 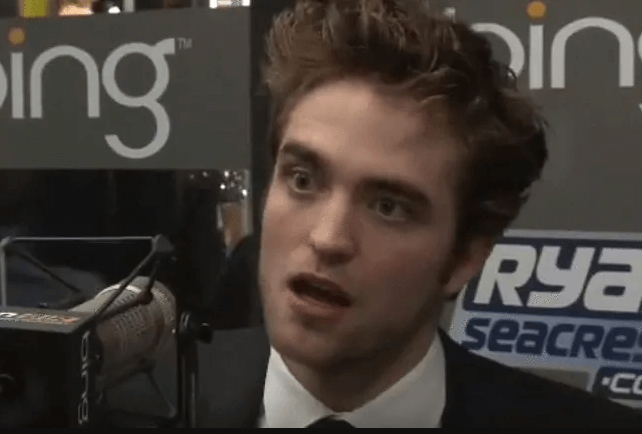 Ryan Seacrest once asked Robert Pattinson about dating Kristen Stewart, with whom he starred in “Twilight”. Robert wasn’t really ready to answer that question, and he just got quiet; the publicist just shut the whole thing down. Robert and Kristen did date, of course, as everyone knows. They broke up in 2012, though, after she had an affair with a director. She is currently dating a model named Stella Maxwell. She is also one of the highest paid actresses—or at least was at one point—in the world. I suppose it is not that inappropriate to ask someone about how they stay in shape. If you are looking to get in better shape yourself, it makes a lot of sense. Her advice is what you would expect, though; that is, after all, how most people stay in shape. You watch what you eat and you exercise. I suppose it is sort of a stupid question. Hathaway, of course, is one of the more successful actresses out there these days. She is certainly one of the highest paid. She was first in a show called “Get Real”, but she really became famous due for her work in “The Princess Diaries”. She was also in “Havoc” and “Brokeback Mountain”. She also starred as Fantine the film adaptation of “Les Misérables”. For that role, she won an Academy Award, which she definitely deserved. She also played Selina Kyle in “The Dark Knight Rises”. She is married to a businessman named Adam Shulman, and the two have a son together. Apparently some journalist really wanted to know if Ariana Grande preferred her phone or her makeup. Which would she choose, that journalist wondered? Talk about a stupid question. You have the opportunity to interview one of the more successful singers and actresses in the world, and that’s what you ask? I can understand why she would be sort of ticked off. What was that reporter thinking? The reporter clearly was not thinking. I don’t know if he lost his job, but he sort of deserved to for blowing such a tremendous opportunity. If you are a reporter, you really should do a bit of research before you interview someone. You do not need to go to journalism school to learn that; that is just common sense. 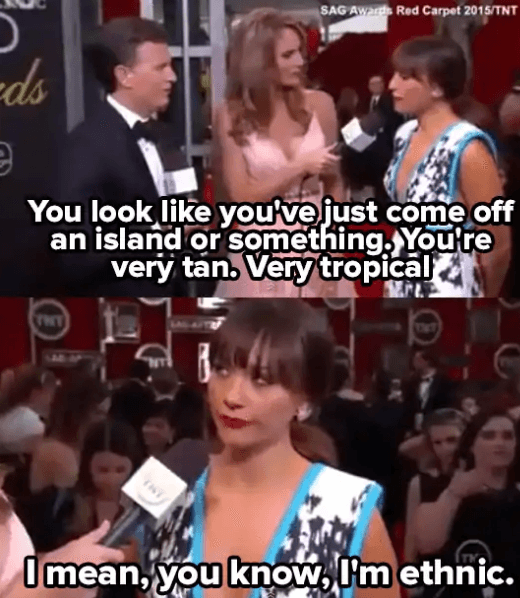 In case you are unaware, Rashida Jones’ father is music legend Quincy Jones, who is considered one of the world’s most influential jazz musicians. 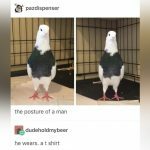 He is an African-American. Rashida is currently starring on the situational comedy “Angie Tribeca”, and she has been doing so since 2016. She also starred on the very popular “Parks and Recreation”. A lot of us remember getting to know her when she portrayed a character on the American version of “The Office”. She might have been an obstacle in the Jim and Pam romance, but the character was still extremely likeable. She has been in several films, too, including “The Social Network” and “The Muppets”. She also graduated from Harvard University, and that is extremely impressive. She is also a writer. Really, she is an incredible human being. There are so many things to ask her about in regard to her life and career. 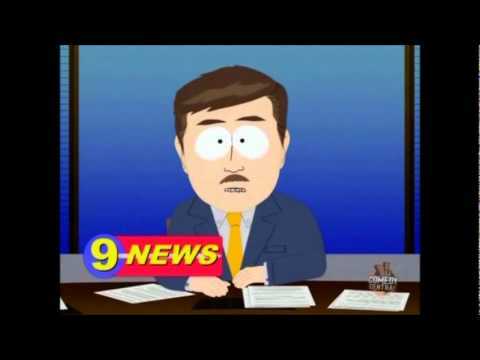 Those reporters were truly moronic. 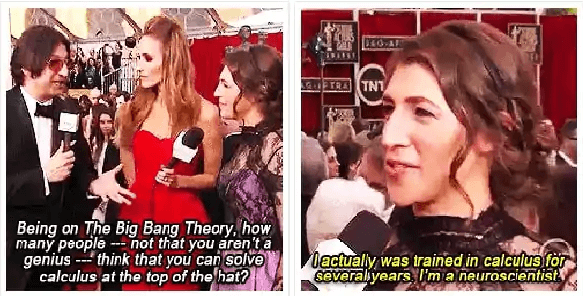 The woman in this image is Mayim Bialik, who first became famous for starring on the 1990s situational comedy “Blossom”. She currently plays a character on “The Big Bang Theory”, which is one of the most popular shows on the air today. She plays a neuroscientist who is married to one of the show’s main characters. In addition to being one heck of an actress, she is probably one of the more brilliant people on the planet. She has a Ph.D. in neuroscience, after all. I don’t know much about that field, but she definitely needed to learn a bit of calculus in order to get that very impressive degree. Reporters really do need to start researching the people they interview. Speaking of actresses who are really good at math, you might be familiar with Danica McKellar. She got her start on “The Wonder Years”. She has a bachelor’s degree in math; she has written several books about mathematics. She still acts, though. For example, she has been in several “Hallmark Channel” movies. She is also a voice actress and was in a couple of episodes of “How I Met Your Mother”. In fact, she has been in an episode of “The Big Bang Theory”. You should never ask anyone about any work they may or may not have had done. That is just bad form. Nobody should have to answer questions about that. That is a truly personal matter, certainly. In this case, reporter Megyn Kelly was asking Jane Fonda about any plastic surgery she had done. Fonda was on the show to promote her film “Our Souls at Night”, but Megyn Kelly apparently had more important things to discuss. You can tell from the look on her face that Jane Fonda was not terribly pleased. Jane Fonda is one of the most famous actresses in the world. She has won Best Actress Oscars, after all. Asking her about plastic surgery is inappropriate and a total waste of an interview. Fonda also won an Emmy for a television film in the 1980s. In addition, she is pretty famous for her exercise videos. They were released in the 1980s and sold millions of copies. Very recently, she was in the film “Book Club”, which also starred Diane Keaton and Candice Bergen. Matt Damon was at a Save Our Schools March back in 2011. His mother is a teacher. It was suggested by a reporter that teachers should work harder. There was a comment about how actors don’t really have any job security, so they work harder. Matt reacted to that comment as you might have expected, and that reaction was not pretty.